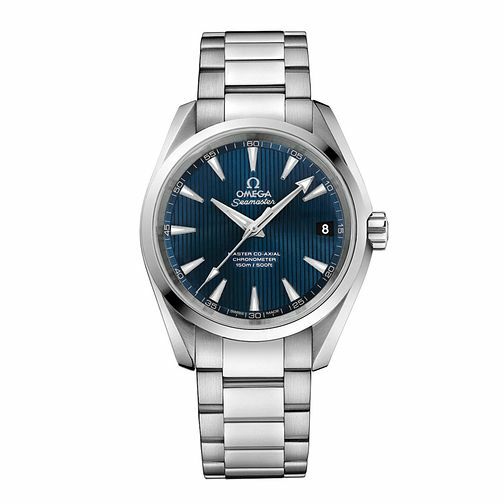 This timeless automatic watch from the Seamaster Aqua Terra collection by Omega is designed with a polished and brushed stainless steel bracelet and a distinguishing deep blue dial for a sleek and refined look. Powered by Master Co-Axial calibre 8500 movement. Omega Seamaster Aqua Terra 150M men's bracelet watch is rated 5.0 out of 5 by 3. Rated 5 out of 5 by Anonymous from An excellent watch I was looking at the smaller 39mm Aqua Terra for some time so when I saw this one on offer at Ernest Jones I purchased right away. The watch has the top quality METAS certified master coaxial movement with very high antimagnetic properties as well as chronometer standard timekeeping. A feature of the watch I find especially useful is the ability to move the hour hand without hacking the watch, useful when travelling. The finish of the watch is excellent, well up to anything comparable in price. Omega overdo the packaging a little but I'll forgive them this since I doubt I'll buy another at this price point. Very happy with my purchase.